President Hassan Rouhani of Iran is making a diplomatic push for better relations with the U.S. as he prepares to attend the UN General Assembly in New York City on Tuesday. As a part of this effort, the newly elected Iranian president penned an op-ed for the Washington Post calling for more constructive engagement with the West. In response, there are suggestions that President Obama may meet with Rouhani in New York, which would be the first such meeting between the country’s respective leaders since 1977. But with global public opinion decidedly anti-Iran, there is a steep hill to climb in Rouhani’s quest to improve Iran’s image and repair relations with the rest of the world. Overall, a median of 20% across the 39 countries surveyed in a spring 2013 Pew Research Center poll had a positive view of the Islamic Republic. 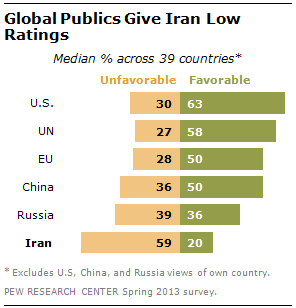 In fact, majorities in most of the countries surveyed had an unfavorable opinion of Iran. In the U.S., 69% expressed a negative view. And compared to ratings of other countries and institutions, Iran is at the bottom of the list, falling behind Russia, China, the EU, UN, and U.S. Meanwhile, global publics are virtually united in the view that the Iranian government does not respect the personal freedoms of its people. The core reasoning for Western sanctions on Iran is to prevent Tehran from developing nuclear weapons. President Rouhani has vowed that Iran will never seek weapons of mass destruction, but there is support among Americans for military action to prevent Iran from acquiring nuclear weapons, if necessary. Among opponents of Iran’s nuclear program, about two-thirds (64%) of Americans would support military action. However, despite Iran’s lack of popularity, support for military strikes does not extend to all countries, and importantly the Russians and the Chinese do not back such an option.